Twelve months after Hurricane Katrina blasted through the levees that had kept New Orleans from becoming a rotting appendage of Lake Pontchartrain, the city is dealing with the stench of another problem, experts say. New Orleans is in a struggle over how it will be rebuilt - and whether the poor and working-class African-Americans who made up a large part of its pre-flood population will ever be able to return. It is not the kind of racism that once gripped the United States - the racism of lynching and disenfranchisement. Racist graffiti and stickers have been spotted, but "you don't have white people point-blank calling black people 'niggers'. You don't have overt, straight-up racism going on," Ted Quant, director of the Twomey Center for Peace through Justice at Loyola University, says. But that does not mean there is racial harmony in the city today, adds Mr Quant, who is black. "Some people celebrated the elimination of blacks from the community." Race, class, money and power are inextricably linked in the US, and the flooding of New Orleans is proving a textbook example of how they intersect. "In the wake of the flood, a small group of powerful business leaders and developers - the old blue-blood elite - took it upon themselves to plan the city into the next 20-30 years," says Lance Hill, executive director of the Southern Institute for Education and Research at Tulane University. The problem was that "virtually no African-Americans" had returned to the city when those plans were being formed, says Mr Hill, who describes himself as a white liberal. There were proposals not to rebuild historically black neighbourhoods, which alarmed African-Americans, he says. 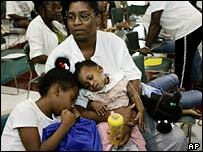 "African-Americans who were displaced became deeply suspicious that their homes were going to be bulldozed, their jobs taken away and their hospitals closed. "There was a general fear that they were being locked out of the city," Mr Hill says. He says he believes the intention was to exclude poor people. But because the city had been racially segregated for generations, the practical effect was to exclude blacks. "If you want to eliminate a high concentration of poor African-Americans by eliminating a neighbourhood, you also eliminate working-class, middle-class, even wealthy blacks," he says. "Class became race in New Orleans." The racial mix of the city has changed since Katrina. A year ago, New Orleans was a city of about 485,000 people, about two-thirds of whom were black. African-Americans are much more likely than whites to think it is important for the city to regain its pre-flood racial mix, a study released in June suggests. Almost two-thirds of black citizens said it was "extremely important". Only one in four whites thought that, while half of the white respondents said it was "not at all important". Mayor Ray Nagin may have been trying to take advantage of those African-American sentiments with his widely-reported pre-election comment that New Orleans should remain "a chocolate city". 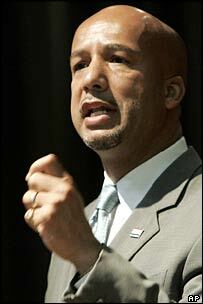 Mr Nagin, who is black, was first elected mayor in 2002 with overwhelming white backing and lukewarm black support. 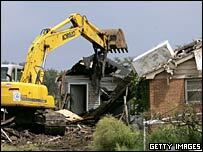 But in the face of African-American anger at his support for rebuilding New Orleans in a way that might exclude them, he reversed course. That alienated the city's white elites and forced Mr Nagin to seek black votes, Mr Hill says. He was re-elected this year with about 80% of the black vote about 20% of the white vote - a dramatic reversal of his 2002 showing. "Now the mayor has a vested interest in bringing back the black community," Mr Hill says. But the mayor is not the only one who feels that way, according to Anne Milling, a prominent white activist and a co-founder of the community group Women of the Storm. 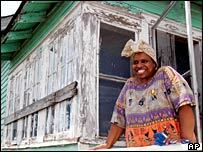 She says it was the mix of people in the city who constituted "the soul of New Orleans", adding that Katrina had, if anything, helped break down racial barriers. "I see people energised by what has happened - blacks and whites and Asians and Hispanics working together." She rejects the idea that the city is engaged in top-down planning that will change the community's racial mix - and says it is simply common sense not to rebuild in areas that were historically swampland. "There is going to be a logical falling-out of places that people should not be living in. "It's not that anybody wants to eliminate any sections of the city or any people who are indigenous. But to spend zillions of dollars and lose it again is foolishness." She says she hopes people who fled the city will be able to find new homes in safer areas. "Everybody wants these people to come back. I am optimistic that we don't have to lose the character and quality of this city. "That would be dreadful. That would be a sterile city and nobody wants that."